David Sammel is an accredited ATP Tour coach and former professional player. 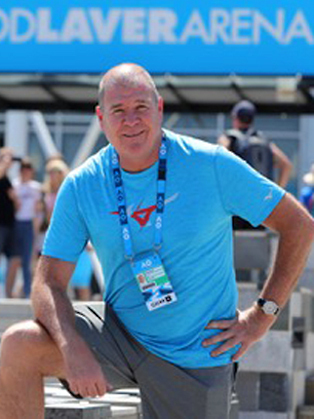 David Sammel has over 30 years’ experience in coaching international players, 17 of whom have represented their countries in the Olympics, Davis Cup and FedCup. David Sammel has coached numerous GB National Champions and worked at all the major tournaments globally. Prior to 2002 he coached on the tour before being appointed Head Coach of an LTA National Academy (2002-2006), thereafter founding the Monte Carlo Academy with Jez Green. He was President of the British Tennis Coaches Association (BTCA, 2009-2012) and his expertise in mental skills has led to numerous speaking engagements, presentations, workshops and consultancy work in several sports, including the LTA, England Rugby, Chelsea, Bolton, Hull and Fulham Football Clubs, UVA basketball, and several academies. He splits his time between the ATP tour and as Head coach for TeamBath, which is an International Tennis Academy. His has published several books with Locker Room Power becoming a #1 Bestseller. Everyone could identify with the presentation. We will certainly focus more on our weapons in future amongst other gems delivered on the day. David spoke clearly and in detail about unlocking the power of the mind and his wealth of experience with interesting anecdotes captivated the large audience. It was a most interesting and thoroughly informative presentation which I would highly recommend to others and gave the pupils much to think about to improve their own performance.